Creativity. It comes in many forms; an ability to write well, paint a portrait, execute a photograph or compose a melody. Generally considered to be a talent, most people believe that creativity is something you either inherently posses by character, or do not. It is often seen as divinely-inspired, unpredictable and bestowed upon only a lucky few, whilst everyone else is, well.. out of luck, really. There are a lot of myths surrounding creativity and how ideas come into fruition, yet none of them are backed by any scientific evidence. New research has prompted David Burkus to write a book - 'The Myths of Creativity: The Truth About How Innovative Companies and People Generate Great Ideas' - in which he aims to demystify what is truly behind the forces and processes responsible for driving innovation. Burkus' research suggests that - with the proper training - anyone with some common sense and a good grounding in reality can deliver creative and innovative ideas. This subject is of particular interest to me as I wrote an essay about the topic back when I was at university - and it's even more relevant to me now, as a young business owner. Apparently, the first step in "becoming creative" is to refrain from limiting your thinking. And this, first and foremost, means that several long-standing myths about creative thinking need to be brought into question. There are many, and I've seen a lot of blog topics and features on this topic lately, so thought I'd add to the noise and chime in with my thoughts. 1. The Eureka Myth - Do new ideas just appear as a flash of insight? Research shows that such insights are actually the culmination of prior hard work on a problem. This thinking, having been given time to incubate in the subconscious mind as we connect threads, then pops out in the form of new, eureka-like innovations. I can see the logic in this theory, but I'm not fully convinced everyone's brain will join up the dots in the same way - or indeed create an outcome. 2. The 'Born This Way' Myth. Many people believe creative ability is a trait held in one’s heritage or genes - but science cannot actually determine whether there is such thing as a creative 'breed'. I reckon people who have confidence in themselves and work the hardest on a problem are the ones most likely to come up with a creative solution. 3. The Originality Myth. There is a long-standing myth about ownership - ie. that a creative idea belongs solely to the person who thought of it. History and empirical research show more evidence that new ideas are actually combinations of older ideas - and that sharing those helps generate new ones. So you don't have to be original to be creative - but it sure helps. 4. The Expert Myth. Many companies rely on a technical expert or team of experts to generate ideas in their relevant areas. Harder problems call for even more knowledgeable (and expensive!) experts. But particularly tough problems often require the perspective of an outsider or someone not limited by the knowledge of why something can’t be done. Ever found an answer to a problem, from the unlikeliest person? I know I have. 5. The Lone Creator Myth. History often attributes breakthrough inventions and striking creative works to a sole person, ignoring supportive work and collaborative preliminary efforts. Is an idea always the creation of one individual? Creativity can be a team effort, and creative teams can help leaders build the ultimate product. 6. The Happy Home Myth. Believers in this myth think that the key to fostering creativity is for everyone to get along and live happily ever after. That's why we see so many cliched start-up environments where employees play ping pong and sit around in the cafeteria in their bare feet, eating complimentary food. I'm on the fence with this one - a friendly habitat is good, but I feel this approach can be too laid back and is in danger of promoting a certain level of placidity. 7. The Constraints Myth. On the flip side, another popular notion is that constraints hinder our creativity and that only people with unlimited resources at their disposal will come up with the best ideas. This is a completely idiotic myth, to me - how quickly can you find focus when working to a completely open brief? I know I definitely operate better within some constraints. 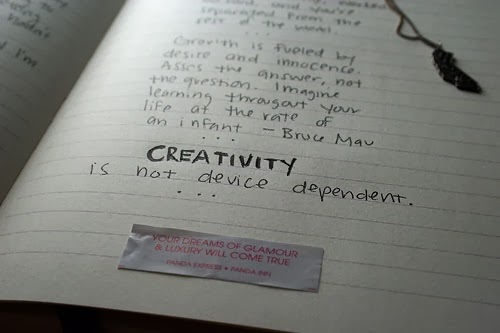 Besides - if you consider yourself creative but you can't work within certain limitations - how creative are you really? 8. The Brainstorming Myth. We've all been made to create a mind map somewhere along our voyage through the education system. Apparently there is no evident that 'throwing ideas around' can lead to breakthroughs, but as someone who loves to map out problems, I disagree wholeheartedly. In my opinion, it takes a very uncreative person to fail to find any way forward using this process. If you believe your company's success depends on your company being more creative, then perhaps it is worth taking the opportunity to spend some time thinking about these myths. Try and understand and nurture the key components in your environment, team and product. Can any of them be better, and if so, how can you improve upon then in a creative way? Are you being subconsciously held back by the belief that you lack the skillset? Hard work beats talent when talent doesn't work hard. کابینت سازی صنعت بسیار پرسودی هست که می تونید در سایت سامان چوب پیگیری کنید کابینت کلاسیک خارجی بسیار زیبا ست. Aucun cowboy n'est complet sans une personne. Vous ne asics homme bordeaux pouvez pas mettre une équipe d'âge à cela puisque les vêtements urbains sont plus sur le goût, le style et le choix contrairement à l'âge. Plus tard, les ingénieurs ont modifié le système organique du matériau, pour s'assurer qu'il peut être plus stable et moins difficile de découvrir le bon matériau en mousse enveloppée - Phylon, le produit de fond le plus utilisé par Nike. C'est vraiment une bête adidas zx flux noir gold du briquet! L'élément Xikar est un briquet à double flamme qui semble posséder la plus efficace de toutes les petites choses. Il a servi à préserver la pluie et il pourrait aussi être un fan pour ces journées chaudes. Vous ne pouvez pas mettre une équipe d'âge à cela puisque les vêtements urbains sont plus sur le goût, le adidas zx flux femme noir et rose pas cher style et le choix contrairement à l'âge. Thanks for this information, it is really valuable blog for me. We also provide digital marketing services like, SEO Service, PPC Service, Facebook Marketing etc for online promotion of your business. Amazing blog, thank you so much for sharing with us this informative blog. Visit Mutual Fund Wala to get better Mutual Fund Schemes.